Students are shown the words friendship, forgiving and reconciliation. On a post-it note students write a word(s) that captures the meaning of the words friendship, forgiving and reconciliation. Students share their words with a group of four to six. Students place their word on a class notice board and begin a Once There was a Boy focus wall. Create a triple Venn diagram and place each of the words friendship, forgiving and reconciliation in a different circle. After a class discussion move selected words from the the focus wall to the overlapping section of the circles. Words may also be graphed e.g. how many students wrote the same words. Post-it notes can be arranged in a bar graph to show commonalities. Now show a video of Dub Leffler introducing his book Once There was a Boy. Students may also view Dub Leffler’s website. In pairs or small groups ask students to discuss what they think will happen in the text and predict how the words they discussed will be evident in the text. Show the end papers and ask students to keep the image in their mind as you read and think about what the illustration shows. Read the text to the students, pausing on the pages that have no text to allow students to ‘read’ the illustrations. Invite students to share their experience of hearing the narrative. Return to the discussion on the end pages. What meaning do the students make of these visuals? What does the use of colour suggest? What artistic technique has the illustrator used to achieve this affect? Do any of the words displayed now apply to the text? Hand out another post-it note to students. Students are invited to write a word that depicts the text for them. Are any of the words already on display from the previous collection? Have you ever felt alone as if you lived on an island? Why did you feel like this? What made a difference and changed your feelings? In groups of four to six students brainstorm the questions on an A3-sized paper. Each group shares with the whole class. Talk about the term reconciliation and what it means in Australia. Talk about Dub Leffler’s Aboriginal ancestry and why he might have been motivated to write this book and its underpinning theme of friendship, forgiveness and reconciliation. How can we reach out to people in our school or neighbourhood who seem to be on an ‘island’? How do we show forgiveness? How can we be active in reconciliation? In groups students brainstorm their ideas. Each group decides on one key strategy which is either written on paper or recorded electronically and shared with the class. Key ideas are displayed on the text wall. As a class, students consider the strategies listed on the Once There was a Boy wall and decide if these strategies are reflected in the school and class ‘rules’. The classroom ‘rules’ or philosophy may be amended to reflect student’s feelings towards inclusion. Students may present their ideas to a school assembly for other students to consider. Students revise the haiku (PDF, 206KB) poetic form of 5-7-5 syllables by discussing the structure and referring to a scaffold. This form of poetry could be taught before this lesson if it is unfamiliar. Students choose a theme (friendship, forgiving or reconciliation) from Once There was a Boy and write a haiku poem. Before beginning, explain the poems will be shared with the class. How are the words identified previously (friendship, forgiveness and reconciliation) portrayed in this picture book? Return to the word wall and ask students to draw the boy and the girl and write appropriate words from the word wall that reflect the characters. Students share their choice of words about the boy and girl and justify their choice. The two (and only) characters in the story do not have a name – what impact do word choices like this have on the reader? Record responses on a class mind map. What affect does the author create by the absence of text on some pages? Students share their experience of the textless pages. Record the responses on this chart (PDF, 107KB). What is the impact of not seeing the characters’ faces? Sometimes we see a silhouette, peering eyes, back of head view, feet view, top down view, hair across the girl’s face, etc. The teacher can record the responses. Revise narrative structure (PDF, 179KB) by asking small groups to identify the orientation, complication and resolution. In three groups students write their version of the orientation, complication or resolution. Students share their work and each section is cut out and used to create a class book of the text. Students read the class version of Once There was a Boy. Different students identify their contribution. Students’ different responses to the text are explored through a class discussion. Students justify their personal perspective. Now draw attention to the illustrations in the text. Discuss the style of illustrations and the affect on the narrative. Review different perspectives from the text: eye level of the viewer, face-to-face with the viewer, birds-eye view, looking up (viewer looking down). Consider how the use of visual perspective helps to tell the narrative and build character identities. Students choose a perspective and illustrate a part of the narrative using a different illustrative technique and design. Students write a caption for their illustration. Display the work in sequence and discuss the possible affect on the viewer. Ask students to identify two significant events from the orientation, two from the complication and two from the resolution of the text. Provide the Important Events (PDF, 108KB) guide for students to record the selected events. Ask students to write and illustrate these events in the correct sequence. Assess students’ understanding of narrative structure. Re-visit previous work with the text and share the word wall and class book emphasising the narrative structure. Re-visit the discussion on the illustrations and different perspectives. Students re-read the text and recount their work on the wordless pages of the text and the possible affect on reading the text. Ask: What was the author’s intent in only using illustrations on some pages? How do you ‘read’ these pages? Engage in a class discussion. What does this mean? Students discuss in a small group, then give feedback to the class. Students are introduced to the terms framing, placement and salience. How does Dub Leffler use these techniques? Where are they evident in the text? Students complete a scaffold (PDF, 112KB) relating to framing, placement and salience in Once There was a Boy. Introduce students to wordless picture books such as Bird by Beatriz Vidal, the series Journey, Quest and Return by Aaron Becker, Flotsam or Tuesday by David Wiesner and The Snowman by Raymond Briggs (see the More Resources section for an extensive list). The question is posed: how do we read wordless picture books? Students brainstorm how they read the books they were offered. How did they ‘read’ the pictures? Acknowledge the strategies shared as important skills in reading a variety of multimodal texts such as television, advertisements and books. Students select a wordless picture book and respond to the scaffold (PDF, 112KB) on salience, placement and framing. Note: this activity is optional. If time is critical it can be omitted and wordless picture books can be explored at another time. Students discuss the meaning of Once There was a Boy. What is the narrative telling us? Does it have a message? What influences might Dub Leffler’s Aboriginal background have had on the decisions he made about this text? Revise metaphors and allegories (if not previously taught). Ask students to complete the scaffold (PDF, 109KB) related to metaphors and allegories. 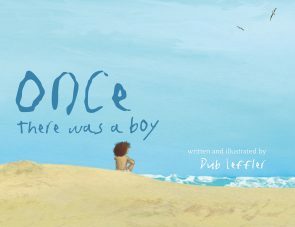 Ask students to independently identify the metaphor in Once There Was a Boy and comment on its effectiveness to convey the author’s message. Students make text-to-self, text-to-text and text-to-world connections. Students record their work in a written format or use an iPad or other recording device. The whimsical story of a little boy with a broken heart who meets a young girl who shares his secret. This timeless and elegant tale is transformed into a beautiful grown-up story by the use of subtle analogies, such as the use of sapotes as forbidden fruit. Discuss the idea of a ‘timeless and elegant tale’ and a ‘grown-up’ story. Discuss the analogies that connect with the students (e.g. the forbidden fruit). As a class revisit the meanings of a metaphor and an allegory. What is the overarching allegory of this text (e.g. broken heart)? Consider the impact of the setting (e.g. total isolation and in need for friendship, trust and love). How does a reader’s past experience with a broken heart influence their reading of the text? Do the students make text-to-self connections? How does an allegory influence the building of character throughout the text (the boy’s emotions are laid bare)? Students consider in small groups then give feedback to the whole class. Repeat the process. Are there any individual metaphors in the text (e.g. imagination jumping up and down)? What are they? Ask students to explore a copy of the text and mark any metaphors with post-it notes. How does the use of metaphors influence the mood of the narrative? How does the use of metaphors influence the building of character throughout the text? Do a whole-class share. Ask students to complete a story map recounting the key events in the text. Focus on whose point of view is being identified. Work is shared and displayed. Students choose a metaphor from the text (e.g. imagination jumping up and down) and illustrate the metaphor showing the comparison of two things that are not alike but the comparison and impact on the reader. Focus on the visual concepts of ‘distance’ and ‘angle’ and their effects on the reader. Recall the discussions on framing, placement and salience from earlier in the unit. If students have chosen the same metaphor, talk about their different illustrative interpretations and the affect on the reader. Different readers may have different responses and these could be discussed. Students revise the material on the word wall and share their understandings of the text and the related grammatical features. Then read the blurb on the back of the book. Ask students to write their own blurb based on their understandings of this text. Allegory and metaphor are figures of speech often seen in literature and art. Metaphor is a phrasal expression, which is used to make a comparison of unrelated objects and actions. Allegory can be said to be an extended metaphor. Allegory is a comparison on a deeper note and can extend throughout larger sections of a narrative, for example. When compared to metaphor, allegory can be longer passages of comparison. An allegory, which is a substitute for another object or action, includes more fine points than a metaphor. While metaphors are generally seen in literature, allegories are seen in literature, sculptures, painting and a lot more, which means that allegory has a wider presentation than metaphor.